The Koenigsegg Agera features a 4.7 liter V8 supercharged engine that produces 910 horsepower at 6850 rpm and 1100 foot pounds of torque at 5100 rpm, running on regular gasoline. 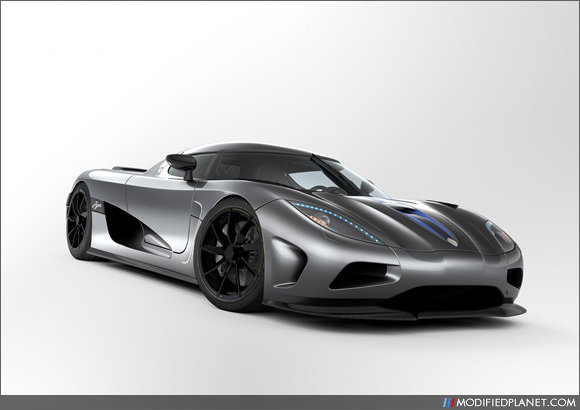 The Koenigsegg Agera sits on Koenigsegg Forged Vortex Generating Centre Locking aluminium wheels. The front wheels are 19â€ x 9.5â€ wrapped in 255/35/19 tires and the rear wheels are an huge 20â€ x 12.5â€ wrapped in 335/30/20 tires. Stopping power comes from 392 mm (front) / 380 mm (rear) ventilated and drilled ceramic brake discs. If that wasn’t enough the Koenigsegg Agera also has an adjustable ABS system. Just to give you an idea of how fast this super car is.. it can go from 0 to 100 kilometers in just 3.1 seconds.